The book is written from a strong acting and stage perspective, by two gentleman who clearly know their art, and how to apply it to business presentations. The acting insights throughout the book serve a purpose, are relevant, and offer pointers and ideas. In places the book does indeed seem to tell you how to fake not just honesty, but any number of different emotions. If you place emotional integrity near the heart of your delivery, then there are bits you’ll find yourself disagreeing with. It’s also worth noting that this is a book based around a successful commercial training concept. The introduction is so laden with marketing plugs for that concept that I almost didn’t get past page ten. I’m glad I did though, because the authors, David Lewis and G. Riley Mills, have good ideas to put across. One of the founding concepts of The Pin Drop Principle is being aware not just of your objective in a presentation, but also your intention; the emotional impression that you want to bring to your delivery. Are you seeking to challenge? To involve? To calm? To warn? Even to manipulate? If you think of a cliche grand actor wandering the stage during rehearsal demanding “Yes, but WHAT’S my motivation?? ?” then you won’t be far off the general concept. The book suggests identifying those motivations, or your intentions, and then demonstrates how you can put them front and centre of your public speaking. If you have had some experience of presenting, and are looking for the next stage, this book will help you put the 3D of emotional intention into your delivery. The authors also combine a couple of topics that many books leave out. There is a section on the inner workings of storytelling, an excellent section on the importance of listening as a presenter, and some strong insights into getting the best out of your voice. Certain fundamental subjects however are under-represented. Controlling nerves is one, and the structure section is another. Both are short. It’s as if the authors had in mind a reader who had already gone through a basic training course. That’s why I would say this is not a book for the novice presenter. If you have already had some professional training and plenty of real-time practice, then this is an ideal book to give you ideas for how to get to the next level. For the experienced presenter there is something to be gained as well. I found the sections on intention, story-telling, and voice to be particularly interesting. I’ve presented a couple of times since reading the book, and on each occasion found sections of it’s content staying with me. The concept of “intention” has led me to consider my daily deliveries from a different angle. Basic tips, such as remembering to protect the voice by drinking plenty of water, have also come as useful reminders for this coffee-addicted presenter. Getting the beginning and the ending close together is something that Lewis and Mills do well. 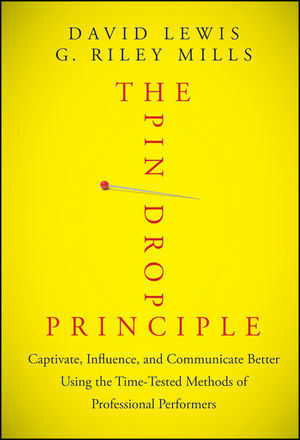 “The Pin Drop Principle” is a lean book, that is a quick read, and importantly, is available as an e-book. For an experienced business person, looking for an easy-to-action evolution in their delivery style, “The Pin Drop Principle” is ideal. « Vocal power to project your pitch. YouTube site will show you how.